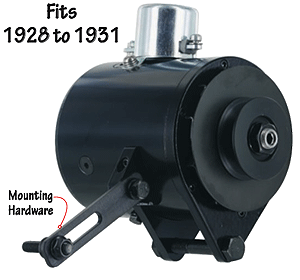 6 volt positive earth 60 amp period alternator kit for the 1928-31 Model A Ford. This unit combines the general look of a generator with the reliability of an alternator. The rear end plate has venting holes to receive air, and the front end has cooling fins around the pulley. This unit will bolt right onto your car and you will be ready to roll in minutes with the one wire hookup. This kit comes with all of the mounting hardware and installation instructions. Due to the powder coating it is essential to run a separate earth wire from the alternator to the frame.